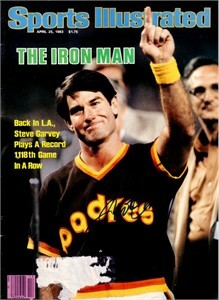 Complete 1983 Sports Illustrated autographed in blue marker by former San Diego Padres star first baseman Steve Garvey. NOTE: has large surface tear where label was removed, otherwise in excellent condition. With certificate of authenticity from AutographsForSale.com. ONLY ONE AVAILABLE FOR SALE.